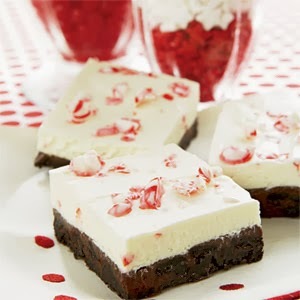 Candy Cane Dessert Squares ~ Rich chocolate and zingy peppermint — is there a better holiday combo than that? Heat oven to 325°F. Combine all crust ingredients in bowl. Press onto bottom of ungreased 13x9-inch baking pan. Bake 10 minutes. Cool completely. Set aside. Melt chocolate chips and 2/3 cup whipping cream in 1-quart saucepan over low heat, stirring occasionally, 4-5 minutes or until smooth. Spread evenly over crust. Place in freezer at least 10 minutes while making filling. Combine powdered sugar, cream cheese and peppermint extract in bowl. Beat at low speed, scraping bowl often, until smooth and creamy. Gently stir in whipped cream and crushed candies. Spread evenly over ganache layer. Sprinkle with additional crushed candy, if desired. Cover; freeze 4 hours or overnight. Cut into squares. 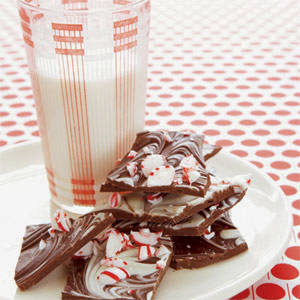 Top each serving with small candy cane, if desired. Serve frozen or refrigerated. Store frozen. 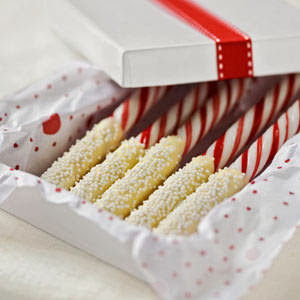 Chocolate-Dipped Peppermint Sticks ~ These peppermint sticks look beautiful and taste even better! Leave out a dish of them when trimming the tree or relaxing by the fire with a mug of hot cocoa. Dip peppermint sticks, one at a time, into melted chocolate. Transfer to a baking pan lined with parchment paper. Allow chocolate to set slightly, about 5 minutes. Roll chocolate end of peppermint sticks in nonpareils. Return to lined pan and let stand at room temperature until chocolate hardens. Simple Holiday Bark ~ Keep around the house for a holiday treat — or wrap it up as a gift! Line cookie sheet with foil. Microwave semisweet chocolate in bowl on medium power 1 minute; stir. Keep microwaving at 15-second intervals, stirring, until melted and smooth; set aside. Repeat process with white chocolate. Spread semisweet chocolate on prepared cookie sheet about 1/3-inch thick. Drop tablespoons white chocolate on top. Swirl chocolates together with tip of knife to marble. Sprinkle with crushed candy. Refrigerate 1 hour, or until firm. Peel off foil; break bark into pieces. It will keep for about a month in an airtight container in refrigerator. 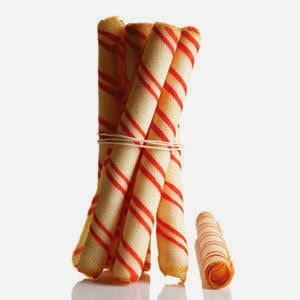 Candy-Stripe Cookie Sticks ~ Festive Candy-Stripe Cookie Sticks are a holiday favorite, but can be enjoyed as a treat any time of year. Preheat oven to 400 degrees. Put egg whites and sugar in the bowl of an electric mixer fitted with the whisk attachment, and beat on medium speed until foamy. Reduce speed to low. Add flour and salt; mix until just combined. Add butter, cream, and vanilla, and beat until combined. Transfer 1 cup batter to a small bowl (set remaining batter aside). Stir in red coloring until desired color is reached. Transfer tinted batter to a pastry bag fitted with a small plain round tip (such as Ateco #2). Secure end of pastry bag with rubber band. Set aside. Put a 3-by-6-inch rectangle (cut out a stencil to use as a guide) on a baking sheet lined with a Silpat baking mat. Spoon a heaping tablespoon of plain batter into the rectangle, and spread with a small offset spatula. Repeat. Pipe diagonal tinted stripes onto each rectangle. Bake cookies until pale golden, 6 to 8 minutes. Immediately loosen edges with a spatula, and flip cookie over. Starting from one long side, roll cookie into a stick. Place, seam side down, on a clean work surface; let cool until set. Quickly repeat with second cookie. Repeat process, tinting and baking 2 or 3 cookies at a time. Cookies can be stored between layers of parchment in airtight containers at room temperature up to 1 week. 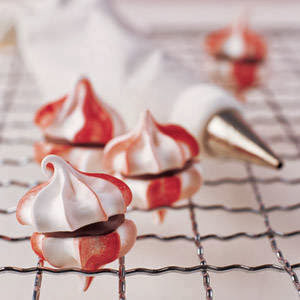 Peppermint Meringues with Chocolate Filling ~ To get the stripes in these beautiful treats use a new small paintbrush to brush two or three evenly spaced stripes of gel-paste food coloring onto the length of the inside of a pastry bag fitted with an open-star tip. Fill the bag with meringue, and pipe star shapes onto a parchment-lined baking sheet. Each time you refill the bag with meringue, paint new stripes inside. Preheat oven to 175 degrees. Line 2 baking sheets with parchment paper; secure corners with masking tape. Fit a pastry bag with a small open-star tip (such as Ateco #22). Set aside. Make meringues: Put egg whites and sugar in the heatproof bowl of an electric mixer. Set bowl over a pan of simmering water, and stir gently until sugar has dissolved and mixture is warm to the touch, 2 to 3 minutes. Transfer bowl to an electric mixer fitted with the whisk attachment. Mix on medium-high speed until stiff peaks form. Mix in peppermint extract. Using a new small paintbrush, paint 2 or 3 stripes of red food coloring inside the pastry bag. Fill bag with 1 to 2 cups meringue. Pipe small (3/4-inch-high) star shapes onto prepared baking sheets. Refill bag as necessary, adding food coloring each time. Bake cookies until crisp but not brown, about 1 hour 40 minutes. Let cool completely on sheets on wire racks. Meanwhile, make ganache: Heat cream in a small saucepan over medium-low heat until just simmering. Pour over chocolate in a small bowl. Let stand 5 minutes. Gently stir until smooth, about 5 minutes. Let ganache cool at room temperature, stirring every 5 to 10 minutes, until thick enough to hold its shape, about 45 minutes. (If ganache sets before using, reheat in a heatproof bowl set over a pan of simmering water; repeat the cooling process.) Fill a pastry bag fitted with a small plain round tip (such as Ateco #5) with ganache. Pipe a small amount onto bottom of 1 meringue. Sandwich with another. Repeat with remaining ganache and meringues. Transfer to wire racks; let set 30 minutes. Cookies can be stored in a single layer in airtight containers at room temperature up to 2 days. 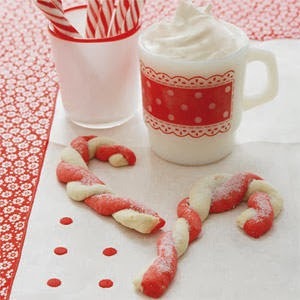 Candy Cane Cookies ~ No Christmas cookie repertoire would be complete without this classic sweet. In a large bowl, beat together 1 cup sugar, butter, milk, vanilla and peppermint extracts, and egg with an electric mixer on medium speed. Stir in flour, baking powder and salt. Divide dough in half. Stir red food coloring into one half. Cover tinted and plain dough separately and refrigerate for at least 4 hours. Preheat oven to 375ºF. Stir together crushed candies and the remaining 2 Tbsp. sugar; set aside. To make each candy cane, shape 1 rounded teaspoon of each color dough into a 4-inch rope by rolling it back and forth on a floured surface. Lay 1 red and 1 white rope side by side; press together lightly and twist. Place on an ungreased cookie sheet and curve top of cookie down to form the cane’s handle. Repeat the process until all the dough is used up. Bake 9 to 12 minutes, or until set and very light brown. Immediately sprinkle candy mixture over cookies. Remove to a rack to cool completely, about 30 minutes. Candy Cane Marshmallows ~ Give out homemade treats that are great in hot cocoa — or straight from the bag. 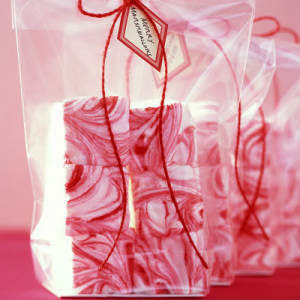 Peppermint marshmallows are easy to make; they get their red swirl from a quick marbleizing technique. Coat an 8-inch square pan with cooking spray; line bottom with parchment paper. Coat the parchment with cooking spray, and set pan aside. Put sugar, corn syrup, and 3/4 cup water in a small saucepan. Cook over medium heat, stirring, until sugar is dissolved. Stop stirring; let mixture come to a boil. Raise heat to medium-high; cook until mixture registers 260 degrees on a candy thermometer. Meanwhile, sprinkle gelatin over 3/4 cup water in a heatproof bowl; let stand 5 minutes to soften. Set the bowl with the gelatin mixture over a pan of simmering water; whisk constantly until gelatin is dissolved. Remove from heat, and stir in extract; set aside. Beat egg whites in the bowl of an electric mixer fitted with the whisk attachment until stiff (but not dry) peaks form. Whisk gelatin mixture into sugar mixture; with mixer running, gradually add to egg whites. Mix on high speed until very thick, 12 to 15 minutes. Pour mixture into lined pan. Working quickly, drop dots of red food coloring across surface of marshmallow. Using a toothpick, swirl food coloring into marshmallow to create a marbleized effect. Let marshmallow stand, uncovered, at room temperature until firm, at least 3 hours or overnight. Cut into squares. Minty Chocolate-Dipped Candy Canes ~ Turn basic sugar cookie dough into a beautiful candy cane-inspired treat. In a large bowl, whisk together the flour, baking powder, and salt. Using an electric mixer, beat the butter and sugar until light and fluffy, about 3 minutes. Beat in the egg and then the vanilla. Reduce the mixer speed to low and gradually add the flour mixture, mixing just until incorporated. Shape the dough into 4 disks and roll each between 2 sheets of wax paper to 1/8 inch thick. Chill until firm, 30 minutes in the refrigerator or 15 minutes in the freezer. Heat oven to 350 degrees F. Line baking sheets with parchment paper. 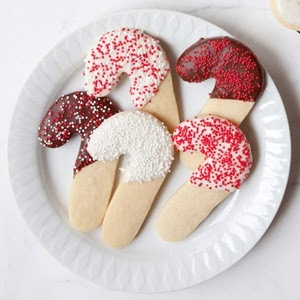 Using floured candy cane–shaped cookie cutters, cut out cookies. Place on the prepared sheets. Reroll, chill, and cut the scraps. Bake, rotating the positions of the pans halfway through, until the cookies are lightly golden brown around the edges, 10 to 12 minutes. Let cool on the sheets for 5 minutes before transferring to wire racks to cool completely. Melt chocolate according to package directions, then stir in the peppermint extract. Dip half of each cookie in the chocolate, letting any excess drip off. Place on a cooling rack set over parchment paper and sprinkle with nonpareils, if desired.